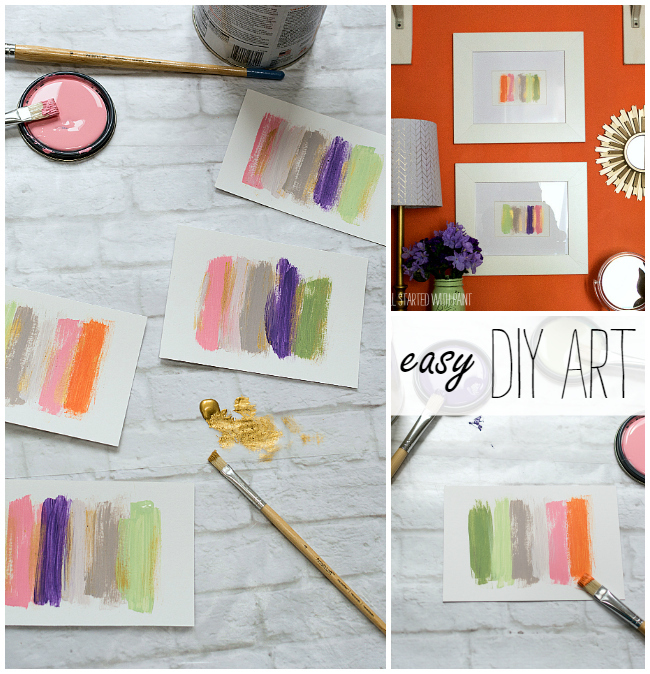 Easy DIY Wall Art Project Idea with Paint & Paper Stock. Okay. Give it to me straight. I’m a big girl. I can handle it. 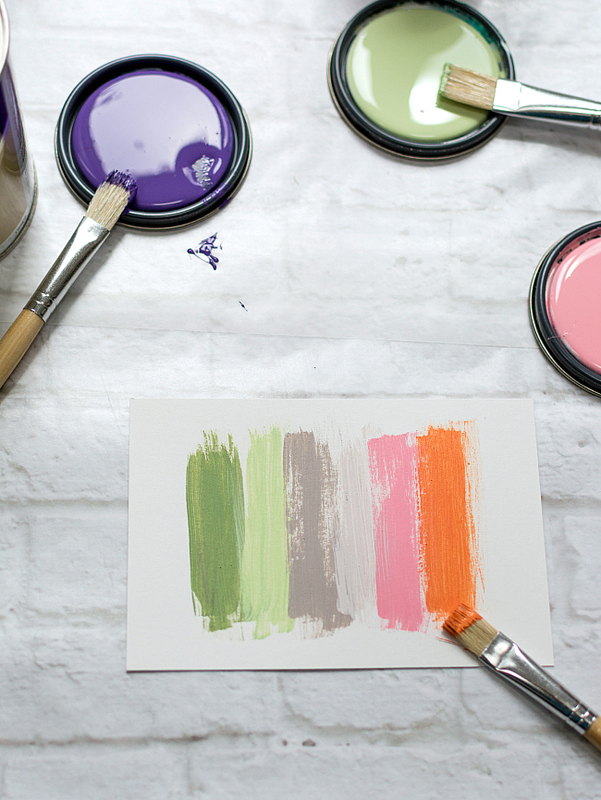 Are you so over the term “pop of color?” Should it be put to rest along with “man cave” (shudder) and “mom cave” (double shudder) and any and all things made with coffee filters? Though, admittedly, I still dream of making a coffee filter wreath one day. And the irony: Here I am asking about the expiration date for “pop of color” as I share with you some pops (plural) of color I added to the interior of my daughter’s closet. Her room is small. Very small. The size of a walk-in-closet small. Luckily, she’s not a clothes horse. Yet. There’s still plenty of time. And I’m ready. I’ve maximized future clothes horse hoarding with the addition of a dresser. In the closet. But I wanted to dress it up. Make it fun. Unexpected. With pops of color. Plural. 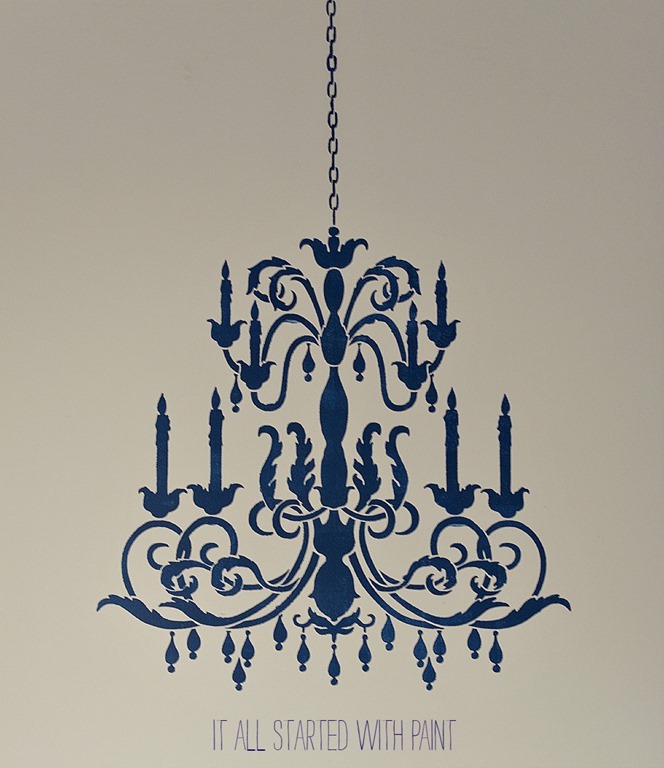 With some easy DIY wall art. 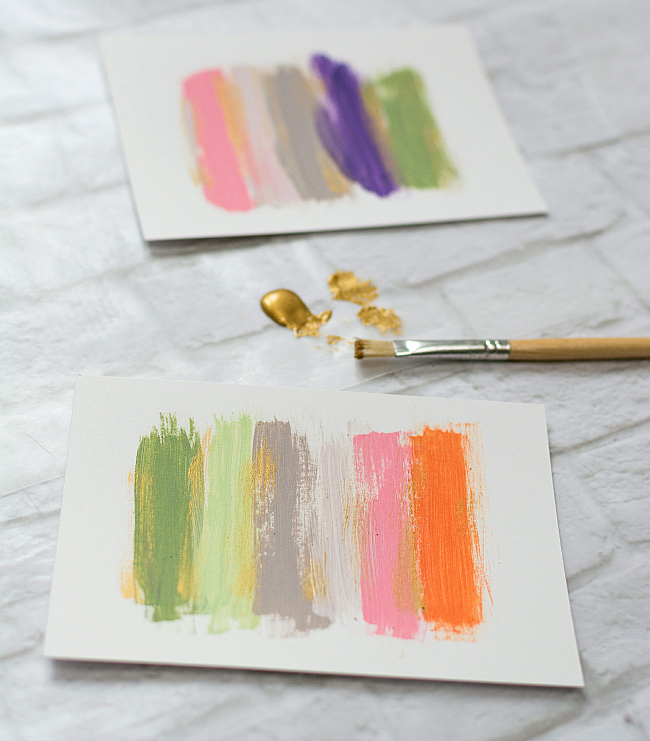 My color palette was picked from one of the three new 2015 OPI Collections by Clark+Kensington, available exclusively at The Paint Studio at Ace Hardware. For my daughter’s closet pops of color, I chose The Adventurista Hawaii Collection by OPI. Because, honestly, if you’re going to pop some color in a closet why wouldn’t you drench it in the colors of the islands? The base of the space is OPI’s Is Mai Tai Crooked? in a flat finish. To evoke a beautiful, tropical sunset. 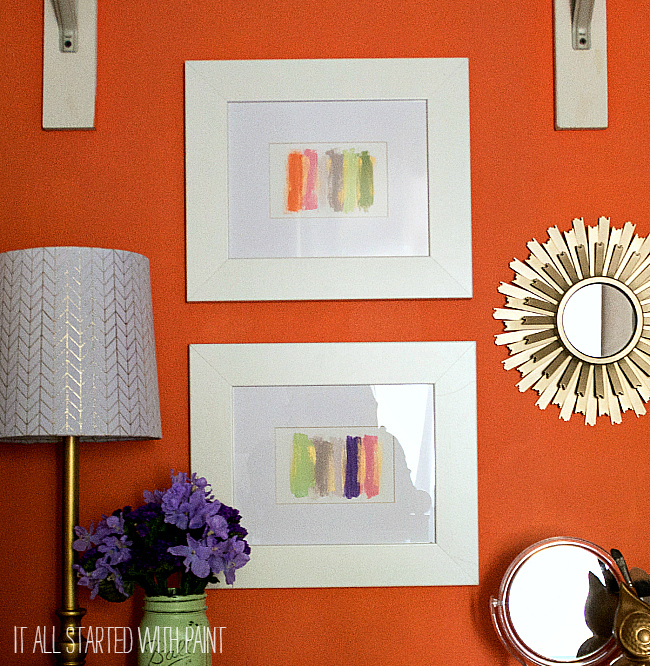 Then I made some super easy DIY wall art to add even more pops. Of color, that is. Clark+Kensington Paint and Primer in One Premium Interior Satin Enamel (counter clockwise from left to right starting with the purple paint lid): Lost My Bikini in Molokini, Town Square, Peaceful Forest, Is Mai Tai Crooked?, Suzi Shops & Island Hops, That’s Hula-rious! 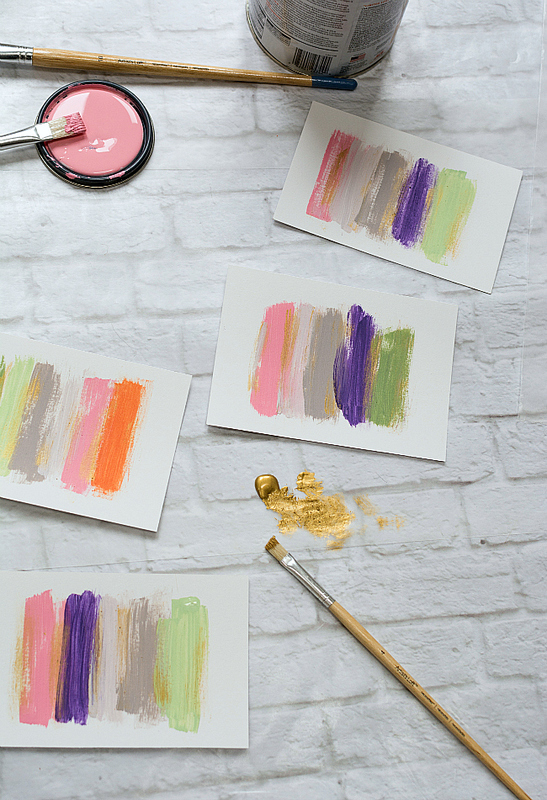 This is the easiest diy wall art project in the history of diy wall art projects. I simply dipped my brush in the paint, dabbed a bit off on a paper plate for a more dry brush look, and then brushed vertical stripes on card stock. To add a bit of “bling” I used the same technique to dry brushed some gold paint on the stripes. Once dry, I framed them out and hung them on the closet wall. Today’s post was written as part of my role as an Ace Hardware Blogger. I was compensated by Ace for this post and for the products used, but all opinions about the products used, about the term pops of color, and about Ace Hardware are my own. I need to paint some walls. I would use it to re-paint my bathroom. i love that fun pop of color, linda! I would get new paint for my bathroom. I need mulch for my flower beds. Love the pops of color! My intention would be to buy paint, but who knows what I’d end up with – it’s sooo darned easy to get distracted when walking the aisles! Thanks for the opportunity! I need some gardening supplies–$100 would just about cover it!! I would probably buy paint and something in the garden dept. I would use it for kitchen items like new baking pans etc. I would buy garden supplies and paint for my kitchen. I would use it for some great gardening items. Birdseed, lawn fertilizer, paint, tools … would be difficult to pare down the list! Thank you! 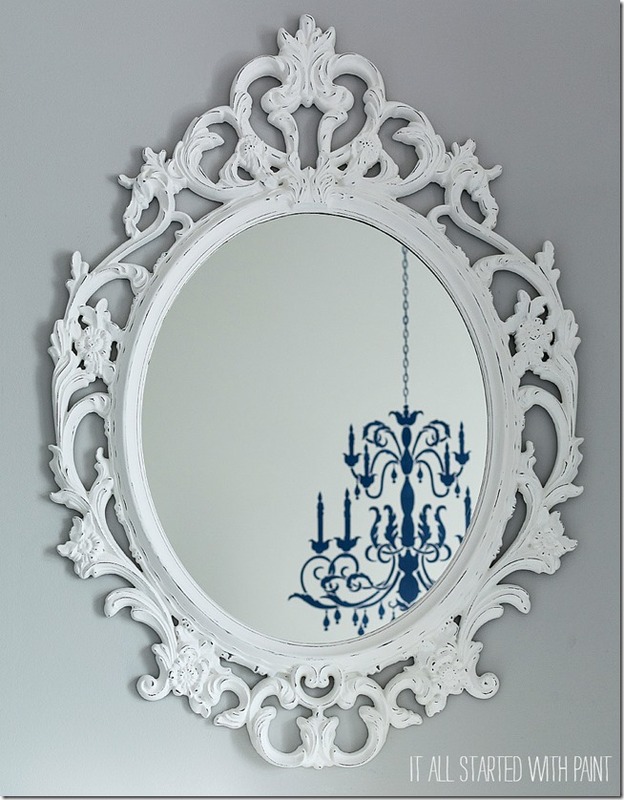 Oh wow, I would definitely get some paint to repaint my bathroom vanity!!! How terrific! I’m just about to take over my son’s bedroom for sewing – the closet doors are in my way. I hope I have enough nerve to remove them and replace with curtains the way you did! If you have more information on how those are hung, please send me the URL or information. 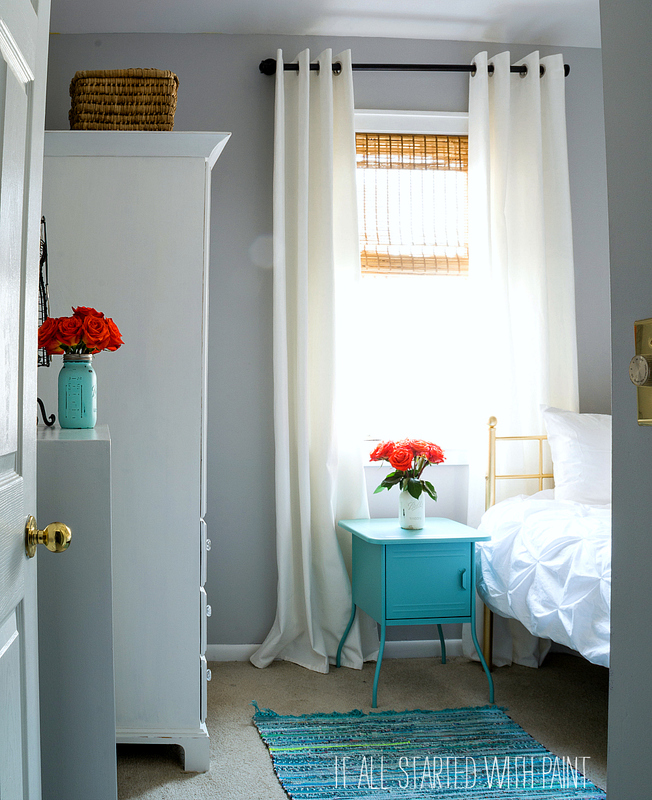 I would use the prize to do the new closet covering, and get bright paint to have a bright closet of my own! Great ideas. Thanks for putting my name in the hat for the drawing. I really need to stain my deck. One hundred dollars would be wonderful! I LOVE YOUR pops of color! 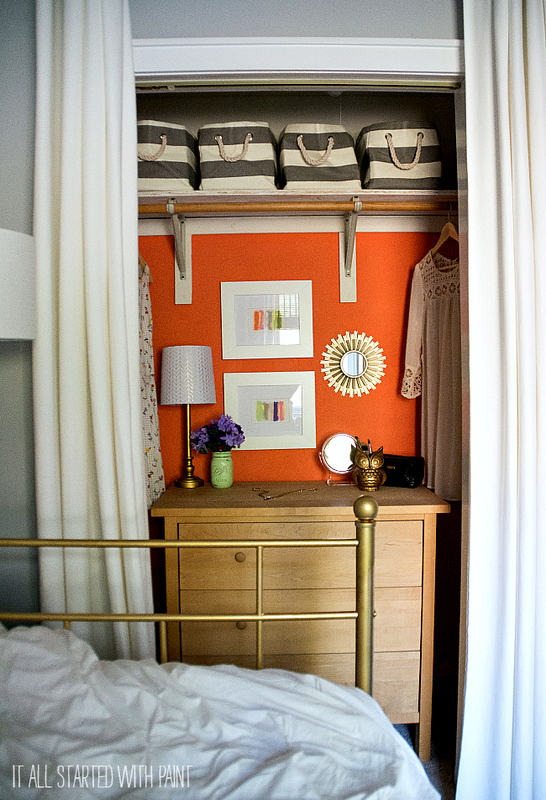 Who would have thought that a closet could look so glamorous! I would love to add something bright like this!!!! I would probably get some annuals for the flower beds to fill in between the perennials. I would love to try the OPI paint colors. I;m in love with all the colors. It would be had to chose only one. I would use for bathroom paint and lights. yes. that is the answer to your question. it doesn’t make me shudder like man cave does, but it is annoying. 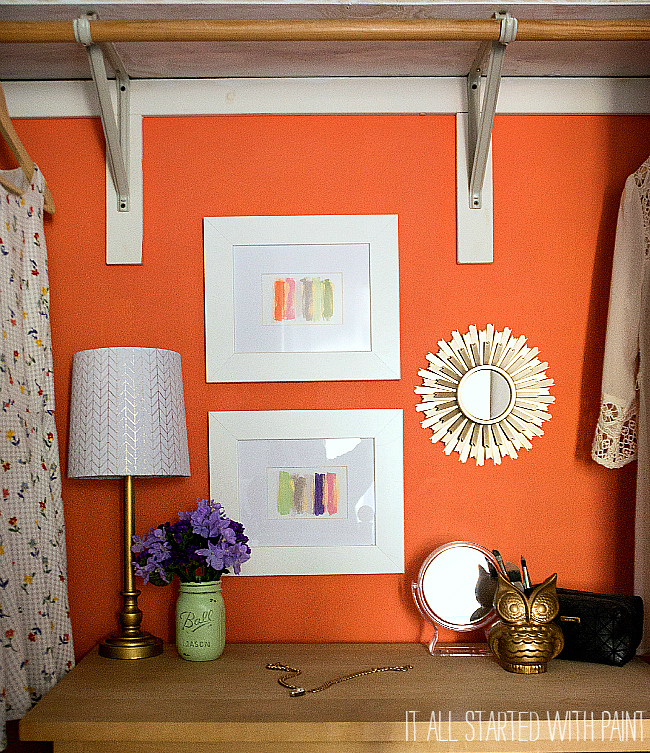 However, the closet is truly a pop of color. I love the look of it. 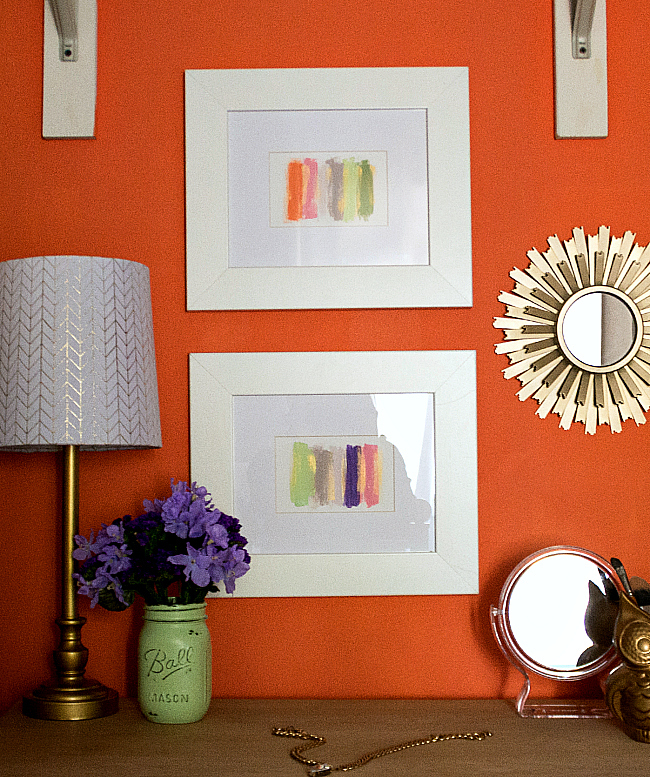 I always paint my closets a color – usually from my paint overflow – but I’ve never done orange. The little art pieces look incredible! They are having an Ace store near me, and I would love to explore, I need hardware to fix things and patching etc, I love that the Ace folks working there can give good advice, not like the big chains. A new Ace Hardware just went in near us. I would use it to buy some paint to paint our shed in the backyard. It really need a upgrade, like a bit ruff. PAINT!!! I want to give my deck a fresh new coat of paint!! Ace really IS the place! And so is this blog! Paint for my son’s room! I love your closet!! 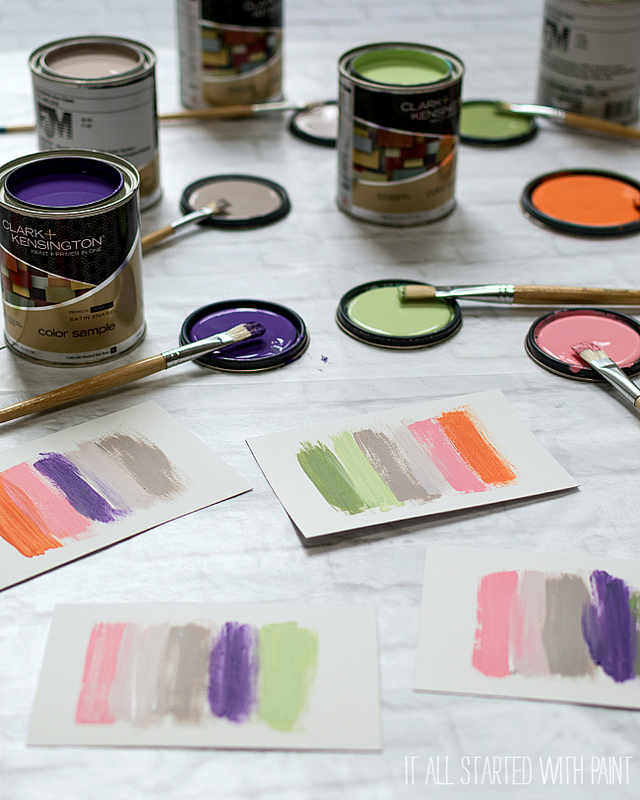 I also love the names of those paints!! I would definitely use it for paint. I would buy items for the garden. Get a new rug for my back patio!! I would buy some fertilizer for my lawn and some door and window caulk to weatherize my home for the winter. I love pops of color! That orange is amazing. Would love to gift this to my husband for Father’s Day! I’m thinking on an alternate word. Bursts? Flings? Sprigs? I would use it for gardening supplies or items to help us update our home! My wife and I are in the process of buying a new house, so I’d probably use the card for paint and maybe some outdoor tools. I’d use it to get some stuff for our new patio!! I would get things for my porch! Thanks for a great give away! First of all, I would never have thought to decorate a closet. Looks great. And that artwork is so simple, but it looks elegant and fun at the same time. I love it. 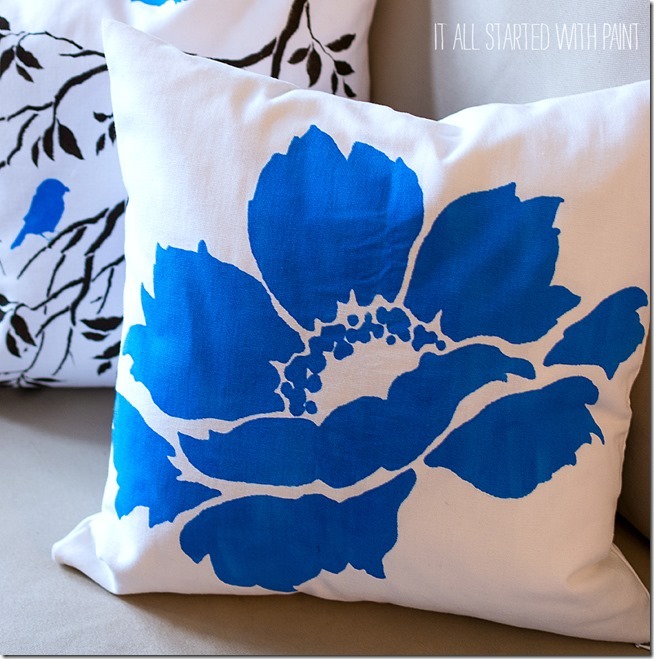 Hey, if you’re interested, I’d love to have you share your stuff on my new blog hop at http://www.myflagstaffhome.com. It’s open all weekend. I love your paintings! I want to try that! I would use the gift card to buy paint for my house. The former owner used cheap paint throughout and it really needs to be repainted throughout. I love your colorful corner!